(Nanowerk News) Stanford electrical engineer Jelena Vuckovic wants to make computers faster and more efficient by reinventing how they send data back and forth between chips, where the work is done. 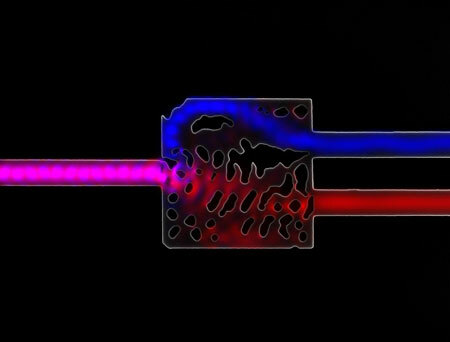 In a Nature Photonics article ("Inverse design and demonstration of a compact and broadband on-chip wavelength demultiplexer") whose lead author is Stanford graduate student Alexander Piggott, Vuckovic, a professor of electrical engineering, and her team explain a process that could revolutionize computing by making it practical to use light instead of electricity to carry data inside computers. In addition to Piggott, the research team included former graduate student Jesse Lu (now at Google,) graduate student Jan Petykiewicz and postdoctoral scholars Thomas Babinec and Konstantinos Lagoudakis. As they reported in Nature Photonics, the devices functioned flawlessly despite tiny imperfections.